At Tel El-Dafna archaeological site in Ismailiya governorate an Egyptian excavation mission stumbled upon what is believed to be a religious stelae that belonging to 26th Dynasty King Wah-Ib-Re. 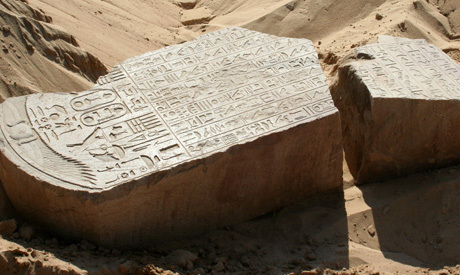 The stelae is engraved with hieroglyphic text but is broken in two pieces; the first is 163 centimetres tall, the second 86 centimetres tall. The base of the stelae was also unearthed. Mohamed Abdel Maqsoud, secretary-general of the Supreme Council of Antiquities (SCA), explained that such style of stelae was well known during the Graeco-Roman time and was called Apris and Hofra in sacred texts. He added that excavation work carried out at Tel El-Dafna in the last three years revealed that the site was not only a military settlement for Greek mercenaries but an Egyptian urban settlement built by King Psamtik I at the beginning of the 26th Dynasty. Abdel Maqsoud pointed out that large storehouses were found at the site’s eastern and southern sides filled with local clay vessels with the shape of god Bes. Imported clay pots from Cyprus were also found, underlining the good trade relations between Egypt and Greece at the time. Workshops for bronze utensils were also found along with ovens and tools. A large temple is also present.